On January 5, the Pipeline and Hazardous Materials Safety Administration (PHMSA) issued a Final Rule incorporating by reference many new, updated, or reaffirmed editions of voluntary consensus standards into the agency’s safety standards under Part 192 (gas pipelines), Part 193 (liquefied natural gas (LNG) facilities), and Part 195 (hazardous liquid pipelines). Of note, the Final Rule adopts ASTM D2513-09a, “Standard Specification for Polyethylene (PE) Gas Pressure Pipe, Tubing and Fittings,” except for Section 4.2, which would have permitted the use of “reworked” plastic materials in the manufacture of plastic piping used for gas service. The Final Rule instead prohibits the use of reworked plastic. PHMSA also indicated its intent to engage with stakeholders on the use of plastic materials in previously unregulated gathering lines that have become regulated because of population encroachment. The Final Rule also amends the Hazardous Liquid Integrity Management regulations to require that operators retain integrity management compliance records for the useful life of the pipeline. On January 13, the National Transportation Safety Board (NTSB) released its 2015 Most Wanted List of Transportation Safety Improvements. Notably absent from this year’s list is pipeline safety, which had been included in 2013 and 2014. PHMSA Rulemaking Update. The table below provides information on the status of PHMSA’s rulemaking initiatives as reported in the Department of Transportation’s (DOT) January Significant Rulemaking Report and by the Office of Management and Budget’s Office of Information and Regulatory Affairs (OIRA) in the Fall 2014 Unified Regulatory Agenda. Revised dates appear in bold. All of DOT’s estimated publication dates have been pushed back, except those for the proposed rules on the safety of gas transmission and on-shore hazardous liquid pipelines. Note that the DOT and OIRA timeframes often conflict, as the DOT report is updated more frequently than OIRA’s regulatory agenda. PHMSA Transmits Evaluation of CPUC’s 2013 Pipeline Safety Program. In December 2014, PHMSA transmitted to the California Public Utilities Commission’s (CPUC) PHMSA’s evaluation of the CPUC’s 2013 pipeline safety program. PHMSA noted a number of areas for improvement. In particular, PHMSA noted that the CPUC lacks jurisdiction over all intrastate pipeline facilities and that its civil penalty caps are below federal levels. PHMSA’s evaluations of state programs are considered in determining federal grants awarded to states to help fund their pipeline safety programs. Collette Honorable Sworn in as FERC Commissioner. On January 5, Ms. Collette Honorable was sworn in as a commissioner of the Federal Energy Regulatory Commission (FERC). Ms. Honorable was formerly the chairman of the Arkansas Public Service Commission and also served on PHMSA’s Gas Pipeline Advisory Committee. She will serve the remainder of former Commissioner John Norris’s term, which expires June 30, 2017. Pipeline Association for Public Awareness Releases Pipeline Safety Video. In January, the Pipeline Association for Public Awareness released a new pipeline safety video for excavators. The video provides an overview of products carried, tools operators use to inspect and monitor pipelines, the importance of dialing 811 before excavating, and what to do in the event of a leak. SB18 (Hill): This bill would authorize the California Public Utilities Commission (CPUC) to require that the $1.4 billion fine proposed by CPUC administrative law judges against PG&E for violations relating to the 2010 San Bruno accident be held in a separate account and not deposited into the state’s General Fund. Most of the funds would be used to offset investments in pipeline replacements in the company’s service territory that otherwise would be recovered from ratepayers. A portion of the funds also would be allocated for an independent monitor to oversee the company’s pipeline operations and to provide seed money for a pipeline safety trust. The bill was referred to the Committee on Energy, Utilities and Communication on January 15. The Illinois Commerce Commission has proposed to amend its gas pipeline safety regulations to (1) incorporate by reference the federal pipeline safety rules in effect on October 1, 2014, and (2) require that owners and operators of gas pipeline facilities submit to the ICC plans, procedures, and programs required or necessary to implement the gas pipeline safety standards. Comments on the proposed amendments were filed December 22, 2014. *In December, 2014, the Kansas Corporation Commission adopted numerous amendments to its pipeline safety regulations. The new regulations became effective January 9. A2711 (Handlin): This bill proposes to create the New Jersey Taskforce on Underground Utility Lines for the purpose of studying issues related to placing overhead utilities underground. The bill was referred to the Assembly Committee on Telecommunications and Utilities on February 24, 2014. S 2422 (Greenstein & Bateman): This bill would require natural gas pipeline utilities to repair or replace leaking natural gas pipelines within time frames to be established by the Dept. of Environmental Protection (DEP). DEP, in consultation with the Board of Public Utilities, would adopt implementing regulations to prioritize time frames for the repair and replacement of pipelines based on the severity of leaks, best practices and repair standards, and de minimis exceptions to the repair and replacement requirements. The penalties for noncompliance would be those set forth in the Air Pollution Control Act (1954). The bill was referred to the Senate Economic Growth Committee on September 18, 2014. New Mexico Public Regulation Commission adopts new rules on excavation and One-Call Requirements. On November 18, 2014 the New Mexico Public Regulation Commission issued a final order amending its rules applicable to excavation damage prevention and One-Call programs. The new regulations require establishment of a “positive response registry system,” and require that underground facility operators’ (UFO) respond to excavation locate requests, even if the UFO determines it has no facilities within the proposed excavation limits. Failure to provide positive responses, pre-mark the intended site, or report damage is a “willful” violation. The final rule became effective December 30, 2014. HB 33 (McCamley): This bill proposes to increase the civil penalties for pipeline safety violations to match limits in the federal Pipeline Safety Act. The bill was introduced on December 15, 2014. *AB 730 (Lentol): This bill would require the Department of Environmental Conservation, prior to the issuance or renewal of a major facility license, to require applicants to demonstrate implementation of state and federal regulations for prompt detection of petroleum discharges from tanks and connecting pipelines, including installation of proper detection equipment. The bill was introduced and referred to the Standing Committee on Environmental Conservation on January 7. On November 10, 2014, the North Dakota Public Service Commission (PSC) issued a notice that it is proposing to amend its pipeline safety regulations to include PHMSA’s gas and hazardous liquid safety regulatory requirements adopted through November 6, 2014. The PSC convened a public hearing on the proposed amendments on December 15, 2014. On January 7, the PSC issued an Order submitting the proposed rules to the Attorney General. The Order notes that, although the PSC has the authority to regulate the safety of the state’s hazardous liquid pipelines, it currently does not have a certified hazardous liquid safety program with PHMSA. SB No. 378 (Coley): The Ohio General Assembly passed legislation that, among other things, (1) provides the Ohio Public Utilities Commission (PUC) with authority to enforce the state’s one-call utility protection requirements; (2) sets forth complaint and enforcement procedures for alleged non-compliance with one-call requirements; and (3) creates an Underground Technical Committee to coordinate with the PUC in administering one-call requirements, receive and review PUC reports on complaints of alleged non-compliance, and recommend remedial action. The legislation was signed by the Governor on December 19, 2014. The Railroad Commission of Texas is conducting a survey of operators of gas and hazardous liquid gathering pipelines in rural areas (for gas, rural means Class 1 areas) to better understand the risk the lines pose to the public. The survey is part of the process of implementing House Bill 2982, which delegated authority to the Commission to regulate gas and hazardous liquid gathering pipelines rural locations. Responses are due January 30. *The Wisconsin Public Service Commission issued a proposed order that would amend its pipeline safety regulations to incorporate the federal safety standards in 49 C.F.R. Parts 192, 193, and 199 amended since January 2013. The proposed order was submitted to the both Houses of the Wisconsin legislature on December 14, 2014, and referred to the Senate Committee on Workforce Development, Public Works, and Military Affairs on January 8. PHMSA Administrator. In October 2014, Administrator Cynthia Quarterman departed PHMSA to join the Atlantic Council. Timothy Butters has been serving as the Acting PHMSA Administrator until a replacement is confirmed. NTSB Chairman. In April 2014, Chairman Deborah Hersman departed the National Transportation Safety Board (NTSB) to become the President and CEO of the National Safety Council. Christopher Hart has assumed the role of Acting Chairman until a replacement is nominated. PHMSA Budget Increase for FY 2015. On December 16, 2014, the President signed an omnibus appropriations bill that includes a significant funding increase for PHMSA’s pipeline safety oversight programs. PHMSA will use a significant portion of the additional funds to hire additional pipeline inspection and enforcement staff. Status of PHMSA’s Implementation of 2011 Act. PHMSA continues to work to implement the rulemaking and study provisions from the 2011 Act. Forthcoming gas and hazardous liquids proposed rules will likely address a number of the 2011 Act provisions. Later this year, Congress will take up reauthorization of the Pipeline Safety Act, and may review PHMSA’s implementation of 2011 Act requirements. Criminal Indictment Against PG&E. In July 2014, the United States Attorney for the Northern District of California filed a superseding criminal indictment against Pacific Gas & Electric Company (PG&E) alleging obstruction of the NTSB’s investigation of the incident and 27 knowing and willful violations of the Pipeline Safety Act related to the 2010 San Bruno incident. Depending upon how they are calculated, the potential fines could range from approximately $14 million to $1.3 billion. PG&E has pled not guilty. 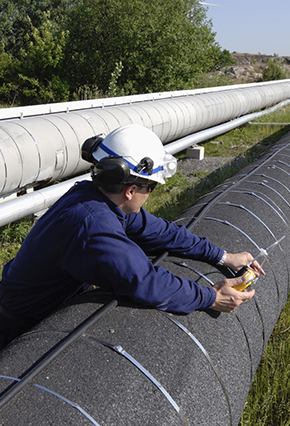 Standards and Guidance for Pipeline Safety Management Systems. PHMSA has been considering a national consensus standard for Pipeline Safety Management Systems (PSMS) which are intended to facilitate holistic approaches to continually improving process safety. In July 2014, PHMSA held a public workshop to discuss PSMS and how to implement certain concepts in that standard, such as management efforts to identify and mitigate safety threats, manage risk, and provide for continuous improvement. In addition, the American Petroleum Institute and American National Standards Institute are continuing the balloting and public comment process on the final draft of API Recommended Practice 1173, which will provide guidance to pipelines on developing and implementing PSMS. Information Collection for National Pipeline Mapping System. On July 30, 2014, PHMSA published a notice and request for comments on a proposed information collection that would require a substantial increase in the amount of pipeline attribute and operational information that operators of hazardous liquid and gas pipelines and liquefied natural gas facilities must submit to the National Pipeline Mapping System (NPMS). PHMSA held a public meeting in November 2014 to address stakeholder concerns about the proposed information collection. PHMSA Oversight of State Programs. On May 7, 2014, DOT’s Office of Inspector General (OIG) released a report detailing the results of its audit of PHMSA’s State Pipeline Safety Program. The report concluded that PHMSA’s guidelines, policies, and procedures do not permit the agency to effectively manage its State Pipeline Safety Program and identify safety weaknesses in state programs. The DOT OIG found that PHMSA’s assessments of state programs were inaccurate and that the agency provided insufficient guidance to states regarding use of financial hardship funds received during the recent recession. The report recommended several procedural and training measures to improve the agency’s oversight of state programs. Methane Emissions. In 2014, the Administration announced a variety of efforts intended to reduce methane emissions from the oil and gas sector. In March, the White House released its “Climate Action Plan – Strategy to Reduce Methane Emissions,” which outlined efforts that federal agencies, including PHMSA, will take to monitor natural gas pipeline systems and to ensure that leaks and accidental releases are minimized or eliminated. In July 2014, EPA’s OIG issued a report recommending that EPA work with PHMSA to address, from a safety and environmental perspective, methane leaks from gas distribution pipelines, and take additional actions to determine if future regulation is appropriate. The White House and Department of Energy (DOE) also announced a number of new initiatives to reduce methane emissions from natural gas systems. The new initiatives include: (1) establishing efficiency standards for new natural gas compressors; (2) recommending that FERC explore cost recovery options for investments to modernize gas transmission infrastructure; (3) working with industry on research and development; and (4) partnering with the National Association of Regulatory Utility Commissioners (NARUC) to accelerate investment in facility modernization and repair. On January 14, the Administration released a Methane Emission fact sheet detailing actions that are intended to reduce methane emissions from the oil and gas sector by 40-45% from 2012 levels by 2025. The fact sheet states that PHMSA will release pipeline safety standards in 2015 that are expected to reduce methane emissions. The Interstate Natural Gas Association of America (INGAA) announced that it will develop industry guidelines for detecting and mitigating leaks on pipelines. INGAA also plans to work with research groups to further validate and refine the estimates of greenhouse gas emissions from transmission and storage facilities. DIMP Implementation. On September 4, 2014, PHMSA hosted a webinar to discuss the implementation of the gas Distribution Integrity Management Program (DIMP). Regulators and operators discussed their experiences implementing DIMP. Class Location and Gas Transmission Integrity Management. On April 16, 2014, PHMSA held a public workshop to discuss whether applying gas integrity management program requirements outside of high consequence areas would mitigate the need for class location requirements. PHMSA may address this issue in the gas transmission proposed rule expected later this year. Pipeline R&D Forum. On August 6 and 7, 2014, PHMSA and the National Association of Pipeline Safety Representatives (NAPSR) held an R&D Forum to identify key technical challenges facing the pipeline industry and government authorities, to disseminate information on current research efforts, and to identify new research that can help to address known challenges. Forum participants discussed a variety of topics, including damage prevention; leak detection and fugitive methane emissions; anomaly detection and characterization; improving risk models; and addressing legacy materials challenges. Pipeline Cracking. On August 5, 2014, PHMSA and NAPSR hosted a public meeting on “Managing Pipeline Cracking Challenges.” Participants discussed issues associated with the detection and characterization of crack-like defects, updates on technological developments for detection, and determining when a probable crack defect must be excavated. Technical Advisory Committee Meetings. PHMSA held joint meetings of its Gas and Liquid Pipeline Advisory Committees in February and October 2014. In 2014, PHMSA issued several advisory bulletins and other guidance documents to clarify its compliance expectations under existing pipeline safety regulations. Although not enforceable, these documents reflect current PHMSA policy and warrant careful consideration, in particular, where PHMSA appears to have departed from past practices and interpretations. Impacts of Flow Reversals, Product Changes, and Conversion to Service. In a September advisory bulletin and accompanying guidance document, PHMSA discussed the notification, operation and maintenance, and integrity management impacts of flow reversals, product changes, and conversions to service. Notably, PHMSA’s guidance suggested that pipelines with certain design and operational characteristics should not be considered for these changes. The guidance also encourages operators to submit a comprehensive written plan to PHMSA prior to undertaking any of these changes. Construction Notification. In September, PHMSA issued an advisory bulletin clarifying the types of activities that qualify as “construction” for purposes of PHMSA’s 60-day pre-construction notification requirement. Construction activities include: materials purchasing and manufacturing; right-of-way acquisition; clearing, grading, and ditching; equipment move-in activities; and onsite or offsite fabrication. The guidance indicates PHMSA’s preference for notification well in advance of actual pipeline construction activities. Meaningful Metrics. Building on a December 2012 advisory bulletin, in October, 2014 PHMSA issued an advisory bulletin and guidance document reminding operators to employ meaningful metrics in evaluating integrity management programs. Operators are encouraged to incorporate additional metrics relating to integrity management; operations; system-specific characteristics; and specific hazards and threats. Oil Spill Response Plans. In a January, 2014 advisory bulletin, PHMSA reminded operators of onshore oil pipelines of the requirements related to the adequacy and timeliness of spill response plans, and highlighted common mistakes that cause plans to be rejected. PHMSA posted dozens of spill response plans to its website in 2014. Lessons Learned from Marshall, Michigan. In May, 2014 PHMSA issued an advisory bulletin discussing the lessons learned in the aftermath of the 2010 crude oil pipeline failure and spill in Marshall, Michigan and encouraging operators to take certain actions to prevent future incidents, such as incorporating performance metrics into integrity management programs, conducting regular training of control room personnel, and assessing public awareness programs and procedures for communicating during emergencies. PHMSA initiated 154 pipeline safety enforcement actions in 2014, around half the number of cases initiated in 2013, and the lowest total since 2003. PHMSA also proposed approximately $2.7 million in civil penalties in 2014, significantly less than the $9.7 million proposed in 2013 and the lowest total since 2004. PHMSA issued 68 orders and decisions on reconsideration in 2014, well below the average of 109 orders and decisions in the previous five years. FERC Proposed Policy Statement on Cost Recovery for Modernization of Natural Gas Pipelines. On November 20, 2014, the FERC issued a proposed Policy Statement that would modify existing agency policy by allowing interstate natural gas pipelines to establish mechanisms for the recovery of facility upgrade costs related to anticipated pipeline safety, reliability, and environmental regulations if certain standards are met. BOEM Increases Offshore Oil Spill Liability Limits. On December 12, 2014, the Bureau of Ocean Energy Management (BOEM) issued a Final Rule increasing the liability limit under the Oil Spill Pollution Act of 1990 for damages caused by responsible parties related to oil spills from offshore facilities, other than deepwater ports. The limit was increased from $75 million to $133.65 million per incident. USCG Proposes Increased Liability limits under Oil Pollution Act. On August 19, 2014, the U.S. Coast Guard (USCG) issued a Proposed Rule that would increase liability limits for vessels, deepwater ports, and onshore facilities (including pipelines) under the Oil Pollution Act of 1990. For onshore facilities, the USCG proposed to increase the liability limit from $350 million to $404.6 million. California - PG&E Penalties. In September, CPUC administrative law judges issued decisions in multiple investigation proceedings and proposed to assess the PG&E $1.4 billion in civil penalties for numerous violations of federal and state pipeline safety requirements stemming from the 2010 rupture of its gas transmission line in San Bruno. In October, PG&E, the City of San Bruno, and the CPUC’s Consumer Protection and Safety Division filed appeals. Texas - TRRC Regulation of Gathering Lines. Last summer the Texas Railroad Commission (TRRC) hosted a series of workshops to discuss the regulation of gas and hazardous liquid gathering lines. The TRRC is also currently conducting a survey of operators gas and hazardous liquid gathering pipelines in rural areas (for gas, rural means Class 1 areas) to better understand the risks the lines pose to the public. The survey is part of the process of implementing HB 2982, which delegated authority to the TRRC to regulate gas and hazardous liquid pipelines in rural locations. Survey responses are due January 30, 2015. Pennsylvania Regulation of Gathering Lines. The Pennsylvania Department of Environmental Protection (DEP) has proposed regulations that would apply PHMSA’s corrosion control requirements in Parts 192 and 195 to gathering pipelines. North Dakota - Regulation of Gathering. In April, new rules went into effect providing the Oil and Gas Division of the North Dakota Industrial Commission with additional authority to regulate underground gathering lines, including their construction, installation, and abandonment. In November, the North Dakota Public Service Commission (PSC) issued a notice that it is proposing to amend its pipeline safety regulations to include PHMSA’s regulatory requirements adopted through November 6, 2014 and PHMSA’s Part 195 regulations applicable to hazardous liquid pipelines. A public hearing on the proposal was held in December 2014. Criminal Indictment Against PG&E. In July 2014, the United States Attorney for the Northern District of California filed a superseding criminal indictment against PG&E alleging obstruction of the NTSB’s investigation of the incident and 27 knowing and willful violations of the Pipeline Safety Act related to the 2010 San Bruno incident. Depending on how they are calculated, the potential fines could range from approximately $14 million to $1.3 billion. PG&E has pled not guilty. Former Pipeline Employee Charged. On January 7, 2015, a former corrosion coordinator for Shell Pipeline Co. pled guilty to knowingly failing to conduct pipeline inspections and an annual pipeline survey and submitting false data to PHMSA. PEER FOIA Challenges. In April 2013, the Public Employees for Environmental Responsibility (PEER) filed a lawsuit in federal district court alleging that PHMSA failed to comply with the statutory deadline in the Freedom of Information Act for releasing documents relating to the onshore oil spill response plan program requirements in 49 C.F.R. Part 194. The lawsuit comes after PHMSA received new authority in the 2011 Act to enforce Part 194 requirements. PHMSA has reviewed and posted dozens of spill response plans to its website. Confidentiality and the Mayflower Accident. Following the 2013 oil spill from the Pegasus pipeline in Mayflower, Arkansas, as part of a class action in federal district court, property owners are challenging Exxon’s designation of numerous documents associated with the line as confidential. The plaintiffs are asserting that the confidential designation prevents the affected property owners and public from determining whether the Pegasus line had been properly repaired and maintained. Tesoro Preemption Challenge. In July 2014, Tesoro Refining and Marketing Co. filed a complaint in federal district court alleging that three ordinances affecting hazardous liquid pipelines enacted by Summit County, Utah are preempted by federal law. The ordinances establish permitting procedures and requirements for hazardous liquid pipelines, including design approval requirements, design and construction criteria, maintenance, repair, and marking requirements, and emergency preparedness plans. The ordinances also include restrictions on placement of hazardous liquid transmission pipelines. Ninth Circuit Hears Appeal Regarding PHMSA Oversight of States. Following dismissal by the district court, the City and County of San Francisco filed an appeal with the Ninth Circuit alleging that PHMSA failed to ensure that the CPUC complied with its duties to enforce pipeline safety standards in California. The parties have completed their briefing, and are awaiting the scheduling of oral argument. Pipeline Safety Initiatives and Proposed Legislation. In May, Canadian officials announced new pipeline safety measures as part of Canada’s broader Economic Action Plan. Many of these safety initiatives, including increased liability limits and reimbursement of cleanup costs, were included in legislation introduced in the House of Commons in December. NEB Engagement Initiative. In November, Canada’s National Energy Board (NEB) announced a “cross-Canada engagement initiative” in which NEB will visit all provinces and northern territories to solicit input on how NEB can improve its pipeline safety program. The initiative also includes an online discussion forum, which is accessible here. AGA Peer Review Program. Building upon a recently completed pilot program, in October, 2014, the American Gas Association (AGA) announced the creation of a voluntary, national Peer Review Program that will allow natural gas utilities to share safety and operational initiatives and identify leading practices and performance enhancing opportunities. CGA 2013 DIRT Report. In September 2014, the Common Ground Alliance (CGA) released its 2013 Damage Information Reporting Tool (DIRT) Report. The DIRT Report noted a 3.5% decrease in damage incidents and an increase in locate requests, suggesting a correlation between increased participation in one-call programs and a decrease in damage incidents. PST Local Government Guide to Pipelines. In September 2014, the Pipeline Safety Trust (PST) released a Local Government Guide to Pipelines to provide general information about how pipelines are regulated and operated, the role of local governments in planning, and recommended practices. PAPA 2014 Pipeline Emergency Response Guidelines. In September 2014, the Pipeline Association for Public Awareness (PAPA) released its 2014 edition of the Pipeline Emergency Response Guidelines providing an overview of pipelines and transported products, incident response measures, and damage prevention. INGAA Report on Communications with Emergency Responders. In July 2014, INGAA issued a report on Current Practices for Communicating with Emergency Responders, which provides potential enhancements and recommended actions that operators and the industry could take to improve communication and coordination in an emergency.